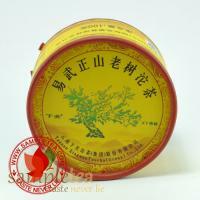 The great "Yiwu Lu Da Shu" Big Green Tree series now comes in tuo cha or bowl tea. This is the first batch from Xiaguan tea factory. This tuo cha has been produced using high quality Yiwu zheng shan lao shu or Yiwu mountain old tree raw and processed by the same master that produced the world famous "Yiwu Lu Da shu" series tea cake for Menghai tea factory in the 90's.